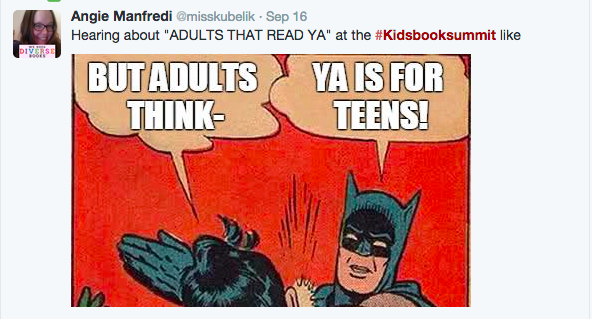 Earlier this month, Nielsen’s #KidsBookSummit caused quite an uproar on Twitter. Among other faux pas, the summit included a panel of adult YA readers who claimed they wanted to see less dystopian, more realism, and a possible name change to the genre (YAH, or young-at-heart, was suggested). Obviously I wasn’t there, I just read the play-by-play through Twitter, but the whole thing seemed all sorts of off and awkward and tone-deaf for a lot of reasons I won’t get into. It also sparked a pretty virulent reaction, mostly from YA writers, and a discussion of who YA is for. Most writers, as well as a few bloggers and librarians, argued that the panel of adult YA fans was irrelevant or that their opinions didn’t matter because, regardless of the percentage of YA books being purchased by adults (80% according to Nielsen) YA isn’t for adults, it’s for teens. Do I consciously think about a teen audience when I write? Do I make every effort to ensure my characters are realistic teens who speak with authentic teen voices and have authentic teen interests? Do I strive to write fiction that will appeal specifically to teens? Do I picture actual flesh-and-blood teens reading my prose on the bus or while curled up in a quiet corner of a high school library? Honestly, no. Because, as I writer, the truth is I’m about as self-centered as it gets. I don’t write for a teenage audience or any audience in particular. I write for me. But wait! Before you declare me an egocentric curmudgeon and start throwing tomatoes, let me try to explain why my self-centered approach isn’t necessarily a bad thing. Seven or so years ago, when I first started writing YA, I really did try to write “for teens.” I kept my plot lines simple because I was under the ridiculous impression that teens can’t handle complex ones. I was careful about my word choices and references. I mostly-adhered to the rule that I shouldn’t mention anything that happened in the old millennia because teenagers allegedly don’t know or care about anything that happened before they were born (though I sincerely hope this isn’t true because, if it is, we’re royally screwed as a culture). Worst of all, I thought about what I really wanted to say to the teens of the world. The end result was stilted, awkward, and condescending at best. As I grew as a writer, I gradually let all that stuff go. I stopped preaching at or trying to represent a demographic and started writing the stories I wanted to write, the way I wanted to write them. I have a theory that true passion projects—projects you work on because you’re psyched out of your mind about what you’re doing and not because you’re trying to reach a target audience—often lead to some of the best art and pop culture artifacts. Though I hesitate to revisit the 1990s with two posts in a row (Because teens don’t care about anything that happened before they were born, right? ), here I go. With all the recent buzz about Nickelodeon rebooting some of the classic Nicktoons and planning a 90s Nicktoons movie, as well as the impending launch of The Splat, a network geared toward millennials and featuring shows from Nickelodeon’s heyday, I’ve been thinking a lot about what made the 90s Nicktoons so great. Is my attachment to them rooted in sentimental nostalgia, or were the Nicktoons of the 90s somehow special? Was there something about them that made them better than most cartoons of the day, as well as most of the modern Nicktoons? I think Carly’s got it partially right. Instead of finger-wagging and preaching at kids or peddling low-quality unwatchable dreck (Captain Planet, anyone? ), the Nicktoons embraced high-quality fun. But I’d argue that even if the network execs had their finger on the pulse of the American pre-pre-teens, the creators of most of the 90s Nicktoons didn’t really have kids in mind. They were passionate about their own ideas and just wanted to make great cartoons. The best example is obviously The Ren & Stimpy Show. It was chock-full of adult-oriented innuendo (Seriously, what’s going on in the closet when Sven visits?) and borderline-psychotic weirdness. Creator John Kricfalusi constantly butted heads with the network over how far he wanted to push the so-called kids’ cartoon into blatantly inappropriate territory and was eventually fired from his own show. And yet, so many people of all ages were smitten with Ren & Stimpy (in addition to Nick, the show also aired frequently on MTV). Lots of my friends dug the grossout-booger-yuks, but the zany strangeness that often took a turn for the surreal pretty much blew my ten-year-old mind. I’d never seen anything like Ren & Stimpy and honestly credit it with shaping my young sense of humor. And let’s not forget—Ren and Stimpy themselves were not kids. Like Rocko of Rocko’s Modern Life and SpongeBob SquarePants himself, Ren and Stimpy appeared to be twenty-somethings trying to eke their way through life. Ren, perpetually struggling with traditional definitions of manhood and his inexplicable need to provide for Stimpy (again, innuendo), came home from work exhausted and disgruntled. And when he wasn’t working or tormenting Stimpy, he was trying to come up with ways to make money so he wouldn’t have to spend so much time at work. Stimpy, the goofball to Ren’s tightly-wound and always-ready-to-explode straight man, appeared to be blissfully along for the ride. Rocko represented a slightly more realistic take on the anxieties of twenty-something life as he confronted a barrage of wacky advertising and got caught up in Kafka-esque tussles with the ever-present Conglom-O megacorporation. In other words, the life-phases of these characters more closely reflected those of the creators than those of the Nicktoon audience. Similarly, the babies of Rugrats weren’t school-age kids and the three protags of Aaahh!!! Real Monsters appeared to be angsty teenagers attending some sort of urban-dump-based boarding school. With the exception of Doug, Hey Arnold! and perhaps The Wild Thornberrys, most of the 90s Nicktoons offered little in the way of directly relatable content for Nick’s primary demographic. But tons of kids, myself included, loved them because they were smart, funny, crazy, and made with raw imagination-fuel and love. And I’m not talking about the kind of ooey-gooey saccharine love that dripped from shows like Care Bears and Barney and Friends. I’m talking about the burning-heart passion that stems from truly caring about what you’re working on and making your project the best it can be. Somewhere along the line, Nick lost sight of this. The above-mentioned SpongeBob SquarePants became ubiquitous and went from silly, witty, and quietly-poignant to a shrill, unwatchable nightmare. Nick acquired more and more cartoons, like Winx Club and Robot and Monster and the many unnecessary Rugrats spinoffs, that seemed like they’d been hastily developed in a stuffy 1980s boardroom rather than in a struggling animator’s one-bedroom apartment. But don’t worry too much, because Cartoon Network appears to have picked up the mantle with animated fare such as Adventure Time, The Amazing World of Gumball, the cancelled but not forgotten Marvelous Misadventures of Flapjack, the ridiculously beautiful Emmy-winner Over the Garden Wall (If you haven’t already seen it, watch it now. It will own you. ), and, of course, Regular Show, which harkens back to era of cartoons featuring twenty-somethings learning how to make it own their own. But those are cartoons!, you say. What does any of that have to do with YA? I knew you’d ask that and I have 2.5 words you: Eleanor & Park. Rainbow Rowell, who writes both YA and adult fic, has made it quite clear she didn’t write Eleanor & Park as a YA novel. Her editor chose to market it as such. There’s no way to know for sure, but I have a feeling if she’d had a specific demographic in mind when writing Eleanor & Park, it might have been a different book. She might have hesitated on the 1980s setting and pop culture references or the amount of profanity or some of the heavy content (the novel, after all, deals with very real teenage problems but is by no means a classic “problem novel” with some kind of heavy-handed life lesson). Please don’t take any of what I’m saying the wrong way. I think it’s entirely possible to keep a specific audience in mind and still be passionate about your project—some people can have it all. I also still think it’s important for writers, agents, and publishers to actively make diverse YA a reality. But as someone who unabashedly writes without a particular audience in mind, I’d like to think there’s something to be said for self-centered passion projects bursting with crazy, weird, joyous imagination and love. For those who still feel inclined, the throwing of the tomatoes may now commence. I’ll throw roses at you :). Okay so of course I agree with nearly everything, but come on. Dreck? Really? If it weren’t for the valuable eco-friendly lessons I learned from Captain America, I’d probably be dumping all of my toxic waste right in the ocean. Though I stand by my original comment when it comes to Cap’n Planet overall, I will admit that the super catchy 80s power pop theme song might not have been dreck. Dammit, Troyson, now it’s stuck in my head.